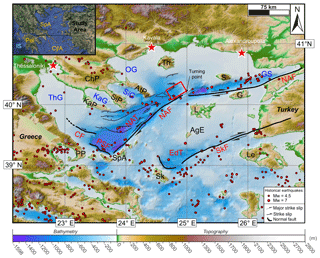 Tsunamigenic potential of a Holocene submarine landslide along the North Anatolian Fault (northern Aegean Sea, off Thasos island): insights from numerical modelling Tsunamigenic landslide along the North Anatolian Fault Alexandre Janin et al. The North Anatolian Fault in the northern Aegean Sea triggers frequent earthquakes of magnitudes up to Mw∼7. This seismicity can be a source of modest tsunamis for the surrounding coastlines with less than 50 cm height according to numerical modelling and analysis of tsunami deposits. However, other tsunami sources may be involved, like submarine landslides. We assess the severity of this potential hazard by performing numerical simulations of tsunami generation and propagation from a Holocene landslide (1.85 km3 in volume) identified off Thasos. We use a model coupling the simulation of the submarine landslide, assimilated to a granular flow, to the propagation of the tsunami wave. The results of these simulations show that a tsunami wave of water height between 1.10 and 1.65 m reaches the coastline at Alexandroupoli (58 000 inhabitants) 1 h after the triggering of the landslide. In the same way, tsunami waves of water height between 0.80 and 2.00 m reach the coastline of the Athos peninsula 9 min after the triggering of the landslide. Despite numerous earthquakes of Mw>7 and strong detrital input (on the order of 30 cm ka−1), only a few Holocene landslides have been recognized so far, asking for tsunami recurrence in this area. 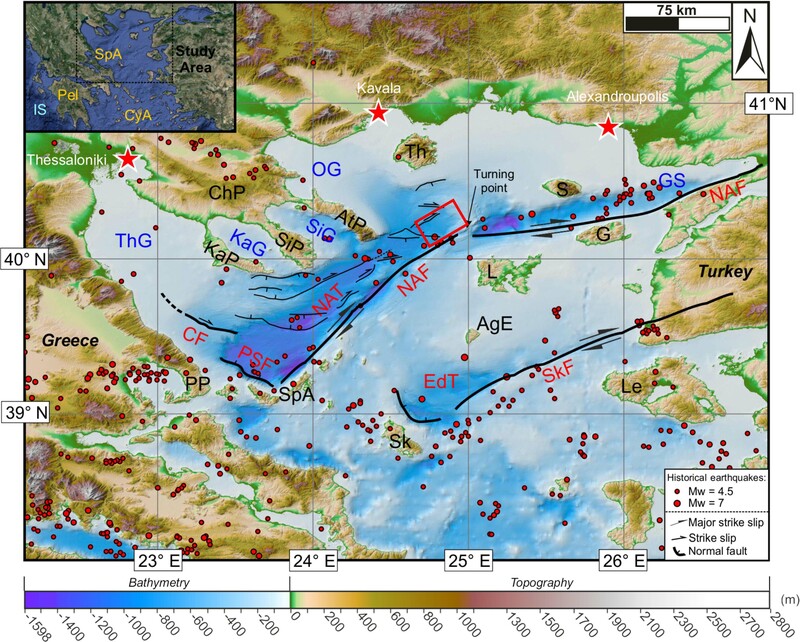 Janin, A., Rodriguez, M., Sakellariou, D., Lykousis, V., and Gorini, C.: Tsunamigenic potential of a Holocene submarine landslide along the North Anatolian Fault (northern Aegean Sea, off Thasos island): insights from numerical modelling , Nat. Hazards Earth Syst. Sci., 19, 121-136, https://doi.org/10.5194/nhess-19-121-2019, 2019. Tsunamis constitute a major natural hazard for coastal populations and infrastructure. Tsunamis result from an impulsive perturbation of the seafloor, which generates waves with a wavelength λ∼100 km and a period in the 10–30 min range. According to the shallow-water approximation, the phase velocity of tsunami waves is expressed by c=gh at long periods, where h is the bathymetry and g is the gravitational acceleration. Although most of the deadliest tsunamis in the last decades result from earthquakes nucleated along submarine faults (Okal, 2015), other sources of damaging tsunamis have been identified, including submarine landslides (Tappin et al., 2008; ten Brink et al., 2014). One of the most conspicuous case study is the July 1998 event that struck the coastline of Papua New Guinea. There, a Mw∼7 earthquake triggered a ∼4 km3 submarine landslide off the Sissano Lagoon. The slide motion generated a tsunami with run-up values that were locally >10 m, which caused more than 2200 casualties (Heinrich et al., 2000, 2001; Tappin et al., 2001, 2008). In the wake of the 1998 Sissano event, numerous studies investigated the distribution of submarine landslides along continental slopes, islands and bathymetric highs, as well as the tsunamigenic potential (Canals et al., 2004; Chaytor et al., 2009; Iacono et al., 2014; Katz et al., 2015; Macías et al., 2015; Masson et al., 2006; McAdoo et al., 2000; Mulder et al., 2009; Palomino et al., 2016; Rodriguez et al., 2012, 2013, 2017; Tappin, 2010; Twichell et al., 2009; Urgeles and Camerlenghi, 2013). 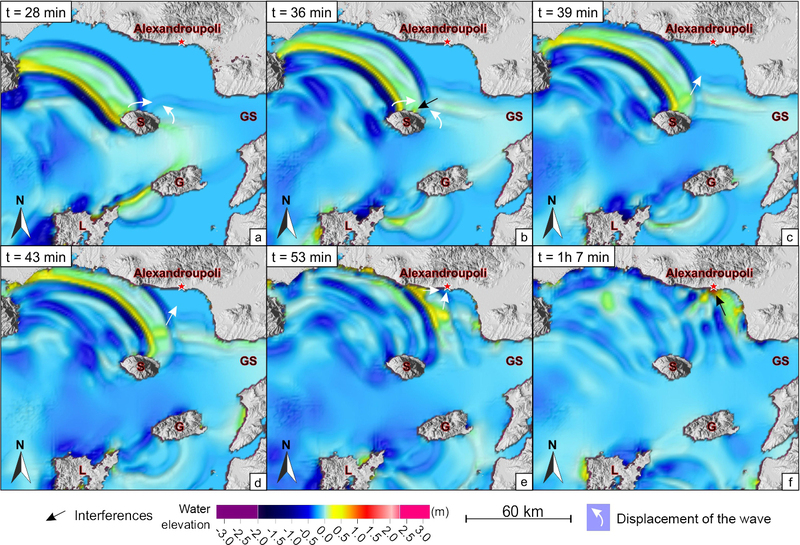 Submarine landslide-generated tsunamis display specific characteristics compared to other sources (Harbitz et al., 2006, 2014; Trifunac and Todorovska, 2002). Vertical displacements induced by the slide can be larger than displacements caused by earthquake-related on-fault seafloor rapture and thus may produce higher wave amplitudes (Okal and Synolakis, 2003). Landslide motion can last over several minutes to hours, leading to complex patterns of wave interactions that either amplify or attenuate the wave amplitude (Harbitz et al., 2006; Haugen et al., 2005; Løvholt et al., 2015; Ma et al., 2013). For landslide volumes on the order of a few km3, frequency dispersion of the tsunami results in shorter wavelengths and faster wave amplitude attenuation, and limits the far-field propagation of the tsunami. Tsunami hazards along submarine strike-slip faults remain poorly investigated. Indeed, earthquakes along strike-slip faults generate only minor vertical displacements of the seafloor, and hence a minor tsunami with an amplitude on the order of a few centimetres. However, releasing or restraining bends with steep slopes may take place along strike-slip faults, promoting submarine failures. For instance, the Mw=6.9 Loma Prieta earthquake along the San Andreas Fault excited tsunamis up to 40 cm high in Monterey Bay, which required a landslide as a secondary source (Ma et al., 1991). The lack of investigation into submarine landslides along a submarine strike-slip fault may therefore result in underestimation of tsunami hazards in some places. Figure 1General morphological features of the studied area. The main faults are indicated (after Sakellariou and Tsampouraki-Kraounaki, 2016). Seismicity since 1 January 1950 is taken from USGS for earthquakes with Mw>4.5. The red rectangle gives the location of the Thasos landslide. In the inset is the location of the study area (background from Google Earth). AgE is Agios Efstratios, AS is Aegean Sea, AtP is Athos peninsula, ChP is Chalkidiki peninsula, CyA is Cyclades archipelago, EdT is Edremit Trough, G is Gokceada (Imbros), GS is Gulf of Saros, IS is Ionian Sea, KaG is Kassandra Gulf, KaP is Kassandra peninsula, L is Lemnos, Le is Lesbos, NAT is North Aegean Trough, NAF is North Anatolian Fault, OG is Gulf of Orfani, Pel is Peloponnese, PP is Pelion peninsula, PSF is Pelion–Skopelos Fault, S is Samothrace, SiG is Sigitikos Gulf, SiP is Sithonia peninsula, Sk is Skyros, SkF is Skyros Fault, SpA is Sporades archipelago and Th is Thasos, ThG is Thermaic Gulf. 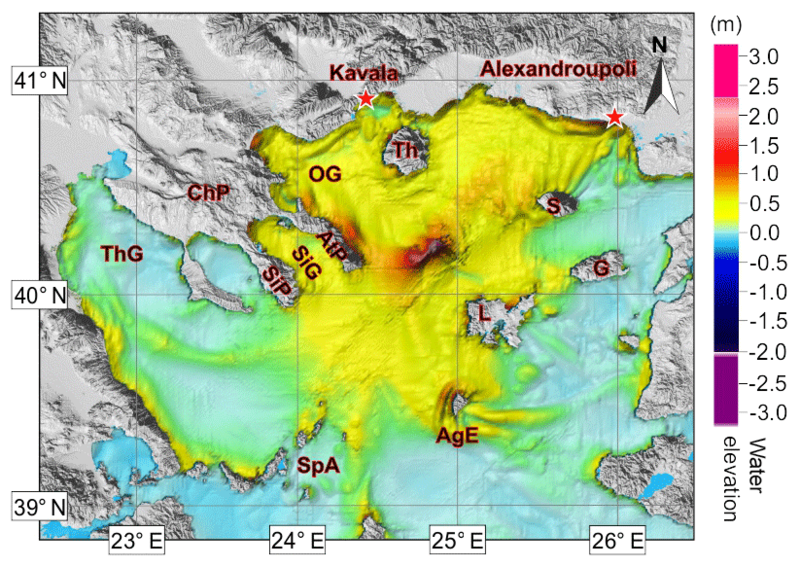 General topography and bathymetry from SRTM30 (Becker et al., 2009) and high-resolution bathymetry (250 m) are from Sakellariou and Tsampouraki-Kraounaki (2016). The North Anatolian Fault (Fig. 1) is a major ∼1200 km long continental strike-slip boundary, which takes up the dextral relative motion between Anatolia and Eurasia at a current rate of ∼25 mm yr−1 (Müller et al., 2013; Perouse et al., 2012; Reilinger et al., 2006, 2010). 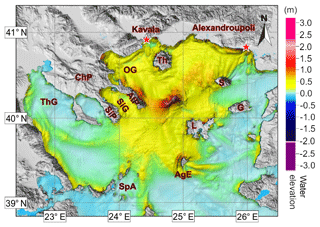 In the northern Aegean domain, the rate decreases from 21.2 mm yr−1 at the Gulf of Saros to 7 mm yr−1 at the Sporades archipelago (Müller et al., 2013). The North Anatolian Fault is one of the most active fault systems in Europe with several earthquakes above Mw∼7 recorded from instrumental seismology in the last decades, including the deadly Izmit and Duzce events in 1999 (Bulut et al., 2018; Hubert-Ferrari et al., 2000). Detailed historical (Altinok et al., 2011) and field studies (Meghraoui et al., 2012) additionally revealed the geological signature of numerous past Holocene earthquakes and tsunamis. In the Marmara Sea, the response of sedimentary systems to the seismic activity has been investigated throughout detailed stratigraphic comparisons between the timing of mass-wasting events and the timing of earthquakes (Beck et al., 2007; Drab et al., 2012, 2015; McHugh et al., 2006). 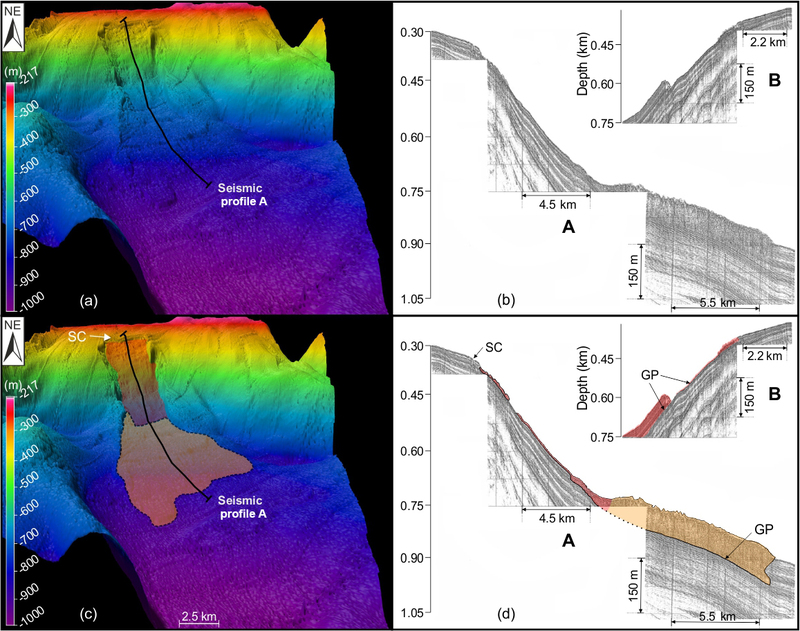 Multibeam and seismic reflection data revealed the signature of numerous submarine landslides (Grall et al., 2012, 2013), some of which may have triggered tsunamis including the AD 1509 event (Alpar et al., 2001; Hébert et al., 2005; Yalçıner et al., 2002; Özeren et al., 2010). Although numerous tsunami deposits have been identified in the geological record along the northern Aegean coastlines (Mathes-Schmidt et al., 2009; Papadopoulos et al., 2014; Reicherter et al., 2010) and despite the numerous cities along the coastline, the tsunamigenic potential of submarine landslides in this area remains only preliminarily investigated (Karambas and Hasiotis, 2012). The North Aegean Trough is a strike-slip basin emplaced along the North Anatolian Fault. Its tectono-sedimentary context is very similar to the Marmara Sea with splays of the North Anatolian Fault, triggering frequent earthquakes up to Mw∼7 (such as the 24 May 2014 Mw=6.9 event in the Gulf of Saros) and with locally gas-charged sediments (Papatheodorou et al., 1993). 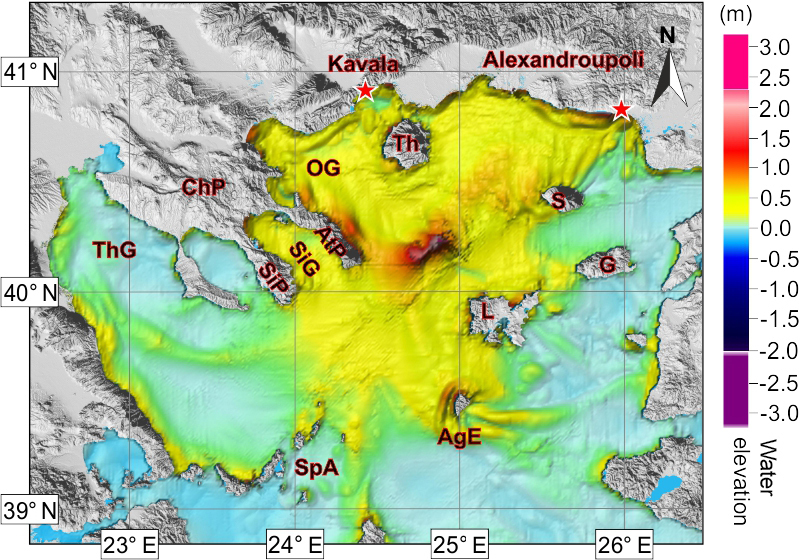 However, only one conspicuous submarine landslide has been identified so far along the edges of the North Aegean Trough (Lykousis et al., 2002). This submarine landslide was emplaced at 40∘15′ N, 24∘52′ E, off Thasos island, somewhere between 5500 and 7500–8500 years ago, and removed several km3 of sediments (Lykousis et al., 2002). The slide was triggered at 300 m depth, less than 50 km away from the surrounding coastlines, i.e. a configuration very similar to the 1998 Sissano event in Papua New Guinea. For simplicity, this landslide is hereafter referred to as the Thasos landslide. 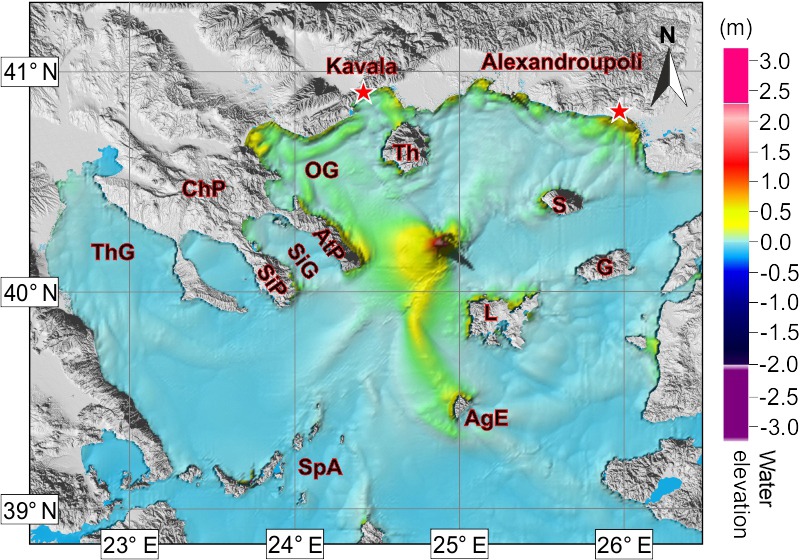 The objective of this paper is to investigate whether the Thasos landslide could have been a potential source of tsunami along the Aegean coasts by means of numerical modelling of tsunami generation and propagation. A particular emphasis is put on the possible wave interactions related to the complex morphology of the Aegean coastlines, with numerous islands, bays and peninsulas (Fig. 1). We adopt a deterministic approach based on the evaluation of credible scenarios defined and validated on the basis of the similarity between the observed and the modelled landslide extents. The geological history of the Aegean Sea takes place in the complex realm of the collision between Africa and Eurasia during the Cenozoic. The Aegean domain used to be a mountain belt (Hellenides) during the early Cenozoic, which collapsed since the late Eocene–early Oligocene, in close relationship with the southwards retreat of the Hellenic trench (Brun et al., 2016; Jolivet and Brun, 2010; Jolivet and Faccenna, 2000; Jolivet et al., 2013, 2015). Since the late Miocene, strike-slip tectonics along the North Anatolian Fault system accommodate the lateral escape of Anatolia (Armijo et al., 1999; Bulut et al., 2018; Faccenna et al., 2006; Ferentinos et al., 2018; Hubert-Ferrari et al., 2009; Le Pichon et al., 2015; Sakellariou and Tsampouraki-Kraounaki, 2018). In the northern Aegean Sea, the North Anatolian Fault system is divided into two main strike-slip systems, shaping the morphology of the seafloor. The age of inception of these strike-slip segments is estimated in the Plio-Pleistocene from ties of a vintage seismic data set with industrial wells (Beniest et al., 2016). The first, main fault segment to the north runs along the Gulf of Saros, where it forms an en echelon, a negative flower structure system that connects the North Aegean Trough (Fig. 1) (Kurt et al., 2000; McNeill et al., 2004). This segment accommodates dextral shearing at a ∼20 mm yr−1 rate (Le Pichon and Kreemer, 2010; Perouse et al., 2012). It corresponds to the prolongation of the Main Marmara Fault (Le Pichon et al., 2001; Roussos and Lyssimachou, 1991), west of the Dardanelles Strait (Fig. 1). Numerous oblique NW–SE to E–W splays connect the North Anatolian Fault and form a horsetail structure, typical of strike-slip fault terminations. The horsetail structure forms a ∼150 km long, ∼60 km wide, ∼1500 m deep basin, referred to as the North Aegean Trough (Papanikolaou et al., 2002; Sakellariou and Tsampouraki-Kraounaki, 2016; Sakellariou et al., 2016), where the oblique splays isolate a series of half-grabens, tilted over a crustal detachment at ∼10 km depth (Laigle et al., 2000). This complex structural pattern results in a very uneven bathymetry, with a series of bathymetric highs and lows within the North Aegean Trough. Southwards, the second strike-slip splay corresponds to the southern branch of the North Anatolian Fault, active at a ∼5 mm yr−1 rate (Le Pichon and Kreemer, 2010; Le Pichon et al., 2014). This structure ends off Skyros island, where it forms the Edremit Trough (Fig. 1). Figure 2Features of the Thasos submarine landslide. In red is the first unit, in orange is the second unit. 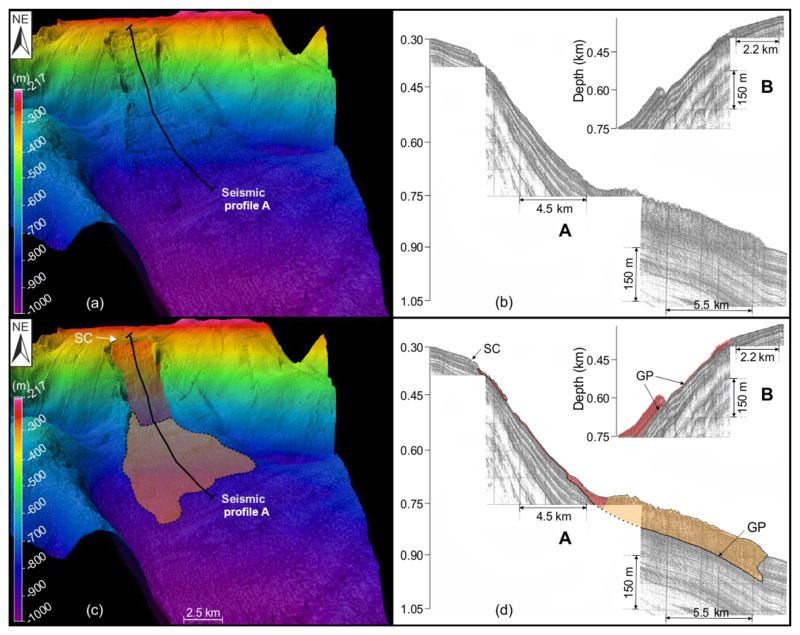 (a) 3-D view of the actual bathymetry of the Thasos landslide. (b) Raw seismic profiles from Lykousis et al. (2002): (A) downslope air-gun sub-bottom profile indicated on (a) and (B) details of the seismic profile along the major glide zone. (c) Interpretation of the 3-D bathymetry: in red is the area in which the deposit is thin or non-existent in the upper part of the slide; in orange is the area where the deposit is thick (marked on the bathymetry by a hummocky facies and in the seismic profile by chaotic and hyperbolic reflectors); SC is slide scarp. (d) Interpretation of seismic profiles with the same convention as in (c), GP is the glide plane. Panels (b) and (d) are modified after Lykousis et al. (2002). During the Quaternary, the deposition of detritic sediments coming from the surrounding lands (Suc et al., 2015) has been controlled by fast subsidence (0.3 to 1.5 m Kyrs−1) (Piper and Perissoratis, 1991) and glacio-eustatic variations in sea level (İşler et al., 2008). In the vicinity of the North Aegean Trough, the late Quaternary (i.e. last 150 kyrs) sediments are composed of pro-delta formations, composed of sandy to silty turbidites (Lykousis et al., 2002; Piper and Perissoratis, 1991). The uppermost sediments (2 m below the seafloor) consist of normally consolidated or slightly overconsolidated muddy to silty sediments, with a bulk density of sediments ranging between 1.4 and 1.5 g cm−3 (Lykousis et al., 2002). Table 1Table of key parameters used for produced the two most credible scenarios. Vi is initial volume, TRUN is total simulated time, the slide stops its displacement at TSLISTOP seconds after being triggered, PHIBAS is basal friction angle, ew is water entrainment coefficient and Vf is final volume of the slide. Figure 3Numerical reconstruction of the final position of the slide for the two credible scenarios. (a) Multibeam bathymetry of the slide. Black dotted line corresponds to the limit of the slide deposit (in orange on Fig. 2). (b) The position of the slide's deposit for the first credible scenario. White dotted line highlights the main transport deposit (above 20 m thick). The resolution of the seismic profile is not enough to track a mass-transport deposit thinner than 20 m. (c) The position of the slide's deposit for the second credible scenario with the same convention as in (b). ω is a coherence index. The higher this index is, the closer the simulation is to the observable data. This index is defined with normalized inverse-distance weighting (Appendix A). SC is slide scarp. On the bathymetry, the slide of around a 30 km long scar encloses an area of 85 km2. Downslope, a 75 m thick lobe-shaped deposit spans an area of ∼50 km2 (Fig. 2a, b) (Lykousis et al., 2002). The mass-transport deposit is characterized by a hummocky facies on the seafloor and displays a typical facies composed of chaotic and hyperbolic reflectors on the seismic profiles (Unit 2, in orange on Fig. 2b, c). A second 5 m thick minor mass-transport deposit spreads across the failure plan over 8.7 km from the top the scarp (Unit 1, in red on Fig. 2b, c). The initial volume, mobilized during the first step of the failure, is estimated following the method described in Ten Brink et al. (2006). It consists in filling in the failed area according to the adjacent scar height. The difference between the filled-in grid and the grid displaying the slide scar gives an initial failed volume at 1.85 km3 in the case of the Thasos slide. The volume of the lobe-shaped mass-transport deposit lying at the bottom of the scar is estimated at ∼3.8 km3 (Lykousis et al., 2002). The difference between the initial failed volume and the final volume of the slide means that during its flow, the slide has captured sediments from the adjacent slope. The slide evolved as a translational slide of well-bedded sediments, over a glide plane corresponding to a muddy weak layer deposited 170–245 kyrs ago (Lykousis et al., 2002). Although earthquake shaking related to the activity of the North Anatolian Fault may be considered the most likely trigger of submarine landslides, recent Mw∼7 events did not trigger significant landslides and tsunami, despite the unstable state of the North Aegean Trough slopes (Lykousis et al., 2002). This discrepancy between strong earthquakes and landslide frequencies has been highlighted in various tectono-sedimentary contexts (Pope et al., 2015, 2016; Strozyk et al., 2010; Völker et al., 2011). Various processes may explain this discrepancy, including the amount and the nature of sedimentary supply, local variations in physical properties of the sediments (Lafuerza et al., 2012) or the overcompaction of the sediments subsequent to the fluid release induced by the seismic wave shaking (Hampton et al., 1996; Strozyk et al., 2010). Some mass-transport deposits, probably older than Holocene, can be guessed on sparker lines in the Sporades basin (Brooks and Ferentinos, 1980; Ferentinos et al., 1981; Rodriguez et al., 2018; Sakellariou et al., 2018) and on sub-bottom profiles crossing the Gulf of Saros (McNeill et al., 2004). However, a comprehensive map of the spatial distribution of landslides and precise stratigraphic constraints on their recurrence are lacking for a further description of how the sedimentary system reacts to the seismic activity of the North Anatolian Fault. Figure 4Tsunami propagation in the case of the first credible scenario. (ew of 10−3 and a basal friction angle of 1∘; Table 1). AgE is Agios Efstratios, AtP is Athos peninsula, G is Gokceada, L is Lemnos, OG is Gulf of Orfani, S is Samothrace, SiG is Sigitikos Gulf, SiP is Sithonia peninsula, SpA is Sporades archipelago, Th is Thasos and ThG is Thermaic Gulf. Table 2Table of maximum elevation (cm) of the water level for 10 places where the tsunami was amplified. Top means above the marine landslide, AgE is Agios Efstratios, AtP is Athos peninsula, L is Lemnos (Gulf of Pournia), OG is Gulf of Orfani, SpA is Sporades archipelago and Th is Thasos. The bathymetric grid used for tsunami calculations is a compilation of several grids of different resolutions. We use the multibeam grid previously published in Papanikolaou et al. (2002), acquired with a seabeam 2120 working at 20 kHz. The horizontal resolution is ∼100 m for a vertical resolution on the order of 1 m. At the slide location, we include the high-resolution (30 m horizontal resolution) grid acquired by HCMR in 2013–2015 on board the Aegeo, in the frame of the YPOTHER project (Sakellariou et al., 2016). The remaining gaps have been filled in with the SRTM PLUS bathymetry (Becker et al., 2009). h(x,y,t) is the thickness of the landslide perpendicular to the glide plane. u is the velocity vector with its components (u,v) in accordance with x and y axis, respectively. c is the sediment concentration at a mean depth. θ(x,y) is the local sliding angle with θx and θy its respective components in accordance with x and y axes. τxz(z=0) and τyz(z=0) are the shear stresses at the bed surface. The constitutive law governing granular flows is generally the Coulomb-type friction law defined in the x direction by τxz(z=0)=κghcos⁡θtan⁡ϕu∥u∥. ew is the water entrainment coefficient (ew∈[0,0.01]) (Fukushima et al., 1985; Kostic and Parker, 2006; Sequeiros et al., 2009). It corresponds to the dilution of the sedimentary mass by water incorporation at the interface between the slide and the water. α is a parameter characterizing the deviation of the velocity profile compared to a homogeneous distribution profile. Modelling landslide as a granular flow requires a linear profile and α=4/3 (Heinrich et al., 2001). The main limit of the simulation of a past submarine landslide is the impossibility of providing constraints on the pattern of velocity and acceleration of the slide from the geological record (Harbitz et al., 2006; Løvholt et al., 2015; Ma et al., 2013). We therefore consider scenarios in which slide velocities are compatible with the few constraints available from submarine cable breaks recorded in the 20th century, i.e., with mean velocity <20–30 m s−1 and initial acceleration <0.6 m s−2 (Fine et al., 2005; Heezen and Ewing, 1952; Mulder et al., 1997). Simulations of the tsunami waves are also based on the shallow-water approximation, which deals with the full interaction of landslide and water, including the deformation of the sediment body. Equations governing the landslide and the tsunami propagation are similar and are thus solved using the same Godunov-type scheme, extended to second order by using the concept of Vanleer (Alcrudo and Garcia-Navarro, 1993; Mangeney et al., 2000). This model is particularly adapted to non-linear waves. The time history of sea-bottom deformation resulting from the landslide is introduced as a known forcing term (cos⁡θ)-1∂h/∂t in the mass conservation equation of the tsunami model (Heinrich et al., 2000). Figure 5Figure of the maximum water elevation of the tsunami for the first credible scenario (Table 1). AgE is Agios Efstratios, AtP is Athos peninsula, G is Gokceada, L is Lemnos, OG is Gulf of Orfani, S is Samothrace, SiG is Sigitikos Gulf, SiP is Sithonia peninsula, SpA is Sporades archipelago, Th is Thasos, ThG is Thermaic Gulf. Figure 6Tsunami propagation in the NE of the Aegean Sea: illustration of a complex system of amplification by interference for the first credible scenario (Table 1). GS is Gulf of Saros, G is Gokceada, L is Lemnos, OG is Gulf of Orfani and S is Samothrace. (a) The arrival in the south of Samothrace of wavefront, (b) rotation of the wavefront around Samothrace and development of constructive interferences in the north of the island, (c) recess of the wavefront of the island, (d) migration to the north for the new wavefront, (e) arrival of another front by the west, (f) constructive interferences in front of Alexandroupoli and formation of a wave of 1.65 m high. We simulate the tsunami that would be triggered in the present-day context by a slide similar to the Thasos slide. Credible scenarios are defined according to the range of parameters able to reproduce as closely as possible the first-order morphology of the observed mass-transport deposit (i.e. fitting the following criteria: area of the deposit, volume, run-out). Credible scenarios (Table 1) are obtained for a range of basal friction angle ϕ between 1.5–1.8∘ and an initial volume of failure of 1.85 km3 (Fig. 3). The selection of the most credible scenarios is buttressed on the basis of normalized inverse-distance weighting (Shepard, 1968) (Appendix A). For each selected scenario, we present maps of tsunami propagation at different, representative time steps (10, 16, 28 and 43 min; Figs. 4, 7). We also plot maps of the maximal water heights reached after a 2 h propagation time in the entire study area (Figs. 5, 8), which helps us to identify the bathymetric forcing effect on the tsunami elevation. The propagation of the tsunami at the source displays the same pattern in every scenario, typical of landslide-generated tsunami (Ma et al., 2013; Mohammed and Fritz, 2012; Ward, 2001). At the source, the incipient radiated wave has two peaks and one trough (Fig. 4). The water ahead of the front face of the slide (i.e. the outgoing wave) is pushed away, creating a leading positive wave in the slide direction (i.e. towards the Chalkidiki peninsula and the Thermaic Gulf). The trough following the crest is simultaneously created by the slide excavation and is followed by a large second positive peak created by the infilling of the trough. In contrast, the front of the wave propagating in the opposite direction of the slide (i.e. the backgoing wave) forms a trough propagating towards Alexandroupoli, followed by a second positive wave (Fig. 4). Among the 40 simulations carried out, we present two of them for which the deposit is well reproduced but leads to different tsunami elevations (Table 2). The first scenario is obtained for a basal friction angle ϕ of 1∘ and a water entrainment coefficient of 10−3. Although the run-out of the modelled slide is slightly overestimated by ∼2 km, the modelled volume is 3.7 km3, which compares closely to the observations (Fig. 3). The thickness of the modelled deposit, between 20 and 40 m, is also in fair agreement with the observations from the seismic line crossing the Thasos slide (Fig. 3). In this scenario, the maximal velocity of the slide reaches the value of 30 m s−1 about 6 min after the slide beginning. During this phase, the acceleration of the slide is on the order of 0.2 m s−2. We describe the propagation of the tsunami following the timing of arrival of the leading wave at the coastline. At the source, the slide generates a tsunami with a maximal water elevation at 3.6 m (Fig. 5). After 8 min of propagation, the leading outgoing wave reaches the Chalkidiki peninsula and the island of Lemnos, with local amplification up to 1.25 m. The front of the outgoing wave then sweeps the coast of the Athos peninsula towards the Gulf of Orfani. There, the leading wave reaches an elevation up to 1.20 m high after ∼40 min of propagation (Fig. 4). The tsunami then propagates into the multiple gulf formed by the finger-like pattern of the Chalkidiki peninsula (Fig. 4). 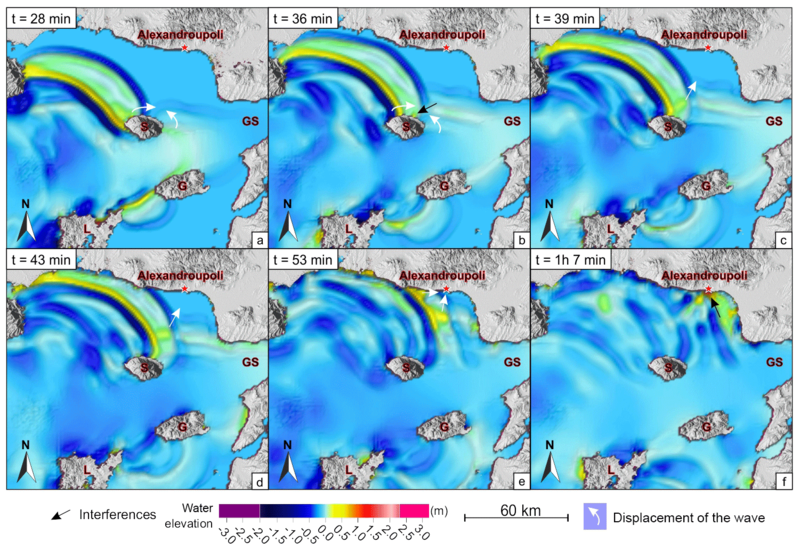 The tsunami enters the Sigitikos Gulf after ∼15 min of propagation, then the Kassandra Gulf after ∼28 min of propagation and eventually the Thermaic Gulf after ∼40 min of propagation. 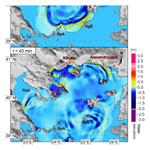 Tsunami elevation reaches 0.8–0.9 m in the Sigitikos Gulf, but remains below 0.4 m in the Kassandra Gulf (Fig. 4). The coastline running from the Sporades to the Thermaic Gulf is struck by a ∼0.5 m high tsunami (Fig. 4). 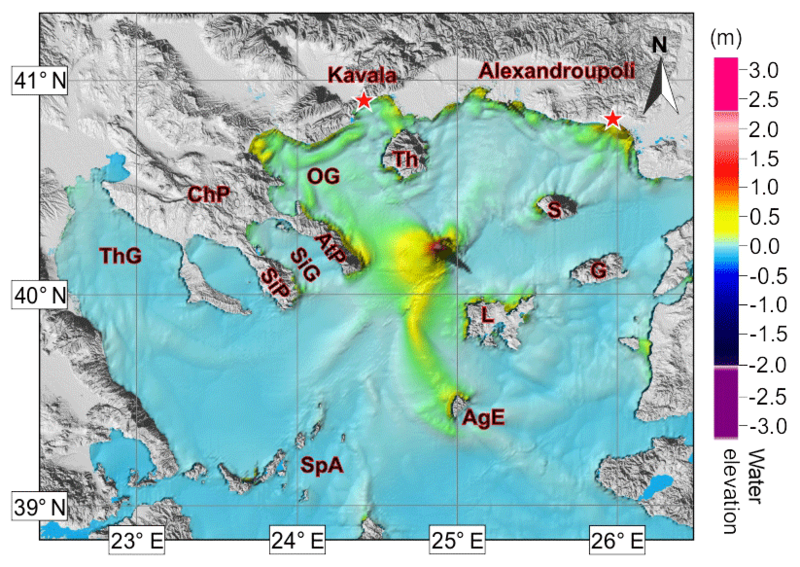 A bathymetric trough related to a splay of the North Aegean Trough off Kassandra peninsula is responsible for the focalization and the amplification of the tsunami before it enters the Thermaic Gulf (Fig. 4). South of the source, the leading outgoing wave reaches the north of Lemnos after ∼10 min of propagation and Agios Efstratios island at t=26 min (Fig. 4), where complex phenomena of wave interactions lead to tsunami elevation on the order of 1.4 m at the coastline. The leading backgoing wave is split into several fronts propagating at different speeds when it reaches the Samothrace and Gokceada islands after ∼16 min of propagation. A 1.65 m high tsunami strikes Alexandroupoli after 1 h 07 min of propagation (Fig. 4). The complex pattern of the Aegean coastline results in a complex pattern of wave interactions that either destroy or amplify the tsunami (Fig. 6). Amplification through resonance is expected within the Sigitikos Bay, the Gulf of Orfani and the Pournias Bay, north of Lemnos (Fig. 4). Southeast of Agios Efstratios and north of Samothrace, we observe lineaments where the tsunami wave is amplified (on the order of 50 cm), despite the lack of bathymetric feature that could explain local forcing. Constructive interferences between the waves that surrounded these islands may produce this amplification. At both locations, the leading wave is split into two wave fronts that rotate along the islands by a coastal attraction phenomenon, until the two wave fronts merge together, leading to wave amplification. For instance, the backgoing wave of the tsunami is split into two wave fronts when it strikes Samothrace at t=28 min (Fig. 6). After their propagation around the island, both fronts collide at t=36 min, which results in constructive interferences that amplify the wave up to ∼0.5–0.6 m. A second positive wave front, which has been amplified along the Thracian coast (Fig. 6 at 43 min), collides with the backgoing wave front formed east of Samothrace. This interference cancels the negative polarity of the backgoing wave and even amplifies the tsunami front up to 1.65 m at Alexandroupoli. The second selected scenario is obtained for a basal friction angle ϕ of 1.5∘ and a water entrainment coefficient ew of 5.10−4. In this model, the area of the mass-transport deposit is larger than the observations, resulting in an overestimated but still reasonable volume of 4.1 km3 (Fig. 3). In this case, the maximal velocity of the slide reaches 25 m s−1 about 3 min after the slide triggering. During this phase, the slide acceleration is on the order of ∼0.15 m s−2. This second scenario leads to the same timing and mode of propagation of the tsunami, with similar processes of wave amplifications and interactions around the islands of Agios Efstratios and Samothrace (Fig. 7). However, the tsunami elevation is less important everywhere than in the first scenario. The maximum water elevation is reduced at ∼85 cm along the Chalkidiki peninsula, at ∼1.10 m at Alexandroupoli and around 50 cm at Agios Efstratios and north of Lemnos. Amplification within the bays of Sigitikos, Kassandra and the Gulf of Thermaikos is also reduced, with water heights less than 20 cm (Fig. 8). Figure 7Tsunami propagation in the case of the second credible scenario (ew of 5×10-4 and a basal friction angle of 1.5∘; Table 1). AgE is Agios Efstratios, AtP is Athos peninsula, G is Gokceada, L is Lemnos, OG is Gulf of Orfani, S is Samothrace, SiG is Sigitikos Gulf, SiP is Sithonia peninsula, SpA is Sporades archipelago, Th is Thasos and ThG is Thermaic Gulf. Figure 8Maximum water elevation of the tsunami for the second credible scenario (Table 1). AgE is Agios Efstratios, AtP is Athos peninsula, G is Gokceada, L is Lemnos, OG is Gulf of Orfani, S is Samothrace, SiG is Sigitikos Gulf, SiP is Sithonia peninsula, SpA is Sporades archipelago, Th is Thasos and ThG is Thermaic Gulf. Our simulations were able to strikingly reproduce the first-order morphological characteristics of the Thassos slide, using basic granular flow behaviour governed by a simple Coulomb friction law at the glide plane. Therefore, the selected range of physical parameters used for the granular flow modelling and the resulting tsunami are considered realistic. Compared to previous studies (Karambas and Hasiotis, 2012), the advantage of our approach is the coupling between the dynamic of the slide, the formation of the tsunami and its propagation. 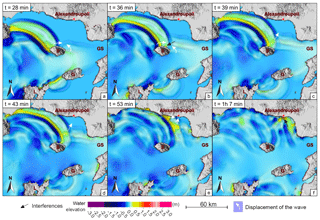 The results of our simulations show that the Thasos slide has probably been tsunamigenic. If a similar slide occurs at the current sea level, the areas of Alexandroupoli (57 812 inhabitants in 2011 according to the Hellenic Statistical Authority), the Chalkidiki peninsula and Agios Efstratios would be the most threatened, with tsunami elevations at the coastline ranging between 1 and 2 m according to the model parameters. The tsunami strikes most of the coastlines of the northern Aegean Sea after less than 1 h of propagation (Table 2). The Athos peninsula is reached after just 10 min, but is not densely populated and the topography does not allow large run-up distances. The geomorphological context of the Thassos slide is similar to the slide at the origin of the Papua New Guinea tsunami in 1998 (roughly the same volume, slope and distance to the coastline), but the numerous interactions between waves due to the numerous bays and islands make the expected height of the tsunami at the Aegean coastline lower. The tsunami simulations have some limits. The first one is the lack of high-resolution bathymetry along the coast, which does not allow for an accurate computation of the flooding on land. It remains unknown whether local bathymetric features or harbours would result in further amplification or dispersion of the tsunami wave. This is especially critical for the numerous gulfs (Orfani, Sigitikos and Kassandra) for which resonance is expected. Run-up values being often more important than the water height calculated a few kilometres from the coastline (Synolakis, 1987), the computed tsunami elevations at the coastline should be considered to be the minimum values of the actual run-up. Moreover, the initial slide acceleration and its speed strongly impinge on the initial pattern of the tsunami, including the pattern of short wavelengths, and therefore on the subsequent frequency dispersion (Haugen et al., 2005). Even if the modelled values of slide velocity and acceleration fit with values measured on slides triggered in the 20th–21st centuries (Heezen and Ewing, 1952; Mulder et al., 1997; Pope et al., 2016), geological records are not sufficient to determine these parameters for the Holocene period. A second-order source of simplification is the non-dispersive numerical model that is not able to account for frequency dispersion inherent in tsunamis with short wavelengths. However, the density of the mobilized sediments is quite low (∼1500 kg m−3) . Frequency dispersion at the source is expected to be negligible for this range of densities (Ma et al., 2013). The results of our simulations show that the expected tsunami waves from the Thasos slide are higher (165 cm for Alexandroupoli or 145 cm for the coasts of Agios Efstratios, Sporades archipelago and Athos peninsula) than values expected in the case of an earthquake along the North Anatolian Fault and higher than run-up values (between 20 and 50 cm south of Thessaloniki) documented from tsunami deposits in the Thermaic Gulf (Reicherter et al., 2010). The study highlights the need to build a comprehensive map of the distribution of landslides within the North Aegean Trough, as well as a full quantification of their volumes, to better estimate the variety of tsunami scenarios in the area. This discrepancy between earthquake and landslide recurrence asks what the response of sedimentary systems is to ground shaking. The tsunami hazard related to submarine landslides similar to Thassos is less severe than tsunami associated with landslides triggered during the 1956 Amorgos event (Okal et al., 2009; Perissoratis and Papadopoulos, 1999) or tsunamis triggered during or subsequent to volcanic events (e.g. Santorini in the Bronze age, Novikova et al., 2011). Bathymetry data are available at http://portal.emodnet-bathymetry.eu/ (last access: 15 January 2019). xk are parameters used for determined the differences between the numerical simulation and the bathymetry. We used for xk: (1) the sliding direction, (2) the total surface of deposit, (3) the amplitude of the discontinuity in the thickness of sediments between units 1 and 2 (Fig. 2) and (4) the final volume of the deposit. xkth are the used observable parameters from the bathymetry and the seismic profiles corresponding to xk. dk(xk,xkth) are distance functions between xk and xkth. Here we define dk as dk=|xkth-xk|. p is a real positive number, called the power parameter. If p>1, the contribution in ω of the small distance is amplified (here we used p=1). The higher the ω, the closer the scenario is to bathymetry and seismic data. The function ω is calculated for all scenarios and allows us to highlight the two scenarios presented in this study. The computation of ω for the two credible scenarios gives ω=181.52 and ω=2.56 (Fig. 3). The supplement related to this article is available online at: https://doi.org/10.5194/nhess-19-121-2019-supplement. We acknowledge the support of the “Yves Rocard” Joint Laboratory between the École Normale Supérieure, the Comissariat à l'Énergie Atomique, and the CNRS.